At Q Air-California, we distribute and service a wide range of oil-flooded industrial rotary screw air compressors, including fixed-speed and variable speed compressors from many of the leading manufacturers across the globe. At Q Air-California, we distribute and service a wide range of oil-flooded industrial rotary screw air compressors, including fixed-speed and variable speed compressors from many of the leading manufacturers across the globe, right here in Ventura & Los Angeles. For decades, we have provided our industrial clients in Ventura & Los Angeles with some of the industry’s most efficient and reliable air compression equipment on the market. With robust and proven designs and multi-option configurations, you are assured of finding the perfect solution for your unique application. The appeal of variable speed compressors is that they react instantaneously to your air compression needs, providing stable plant pressure that fluctuates with demand. 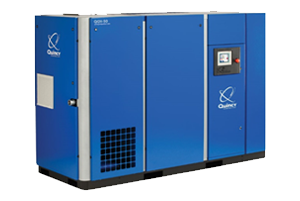 With Q Air-California, our professional team will help you to not only select the right variable speed rotary screw air compressor, but also optimize it for your applications and schedule preventative maintenance to maximize performance and longevity. Still, with your equipment working hard for days at 100%, it is prone to wear and breakdown. Our professional team can provide scheduled maintenance and 24/7 emergency repair services for your total peace of mind. If you have limited space, our variable speed oil-flooded rotary screw compressors come in a single package consisting of a fully integrated air compressor, tank, and optional dryer that offer quiet operation and occupy a small footprint. Contact Q Air-California today to find out more about our variable speed rotary screw industrial air compressors and post-sale services.